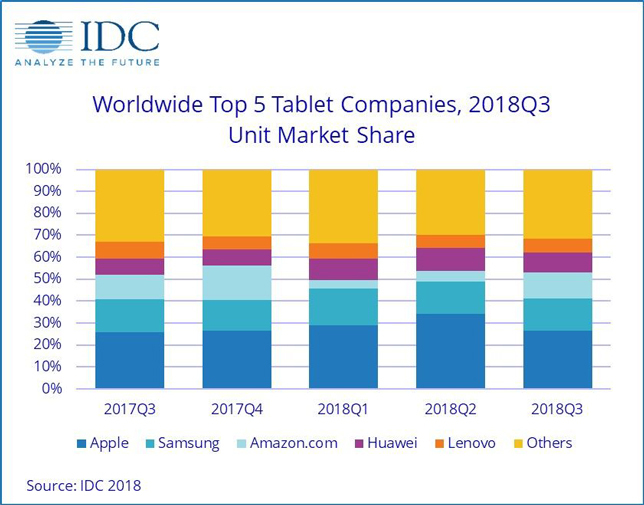 While Apple still dominates the tablet market, sales of all such devices have fallen worldwide, according to market data from International Data Corp. The latest quarterly tablet tracker found shipments down by almost 9 percent during the third quarter of 2018. "Slate"-style tablets, which make up 87 percent of the market, shrunk 8 percent from the previous year; the remainder, "detachable" tablets, declined by 13 percent. Lenovo, whose tablets span every possible category, saw shipments drop by almost 25 percent year-over-year. According to the analyst firm, Lenovo has been "heavily focused" on extending its reach in the traditional PC market, allowing it to regain the top position in that market, while slipping to fifth place in the tablet market over the quarter.